Chemicals in the environment can mimic endogenous hormones. These small molecules, termed endocrine disrupting compounds, include insecticides, industrial chemicals and pharmaceutical products that are released or escape into the environment. Animals are especially sensitive to these compounds during critical periods of development when organs and tissues are formed. Humans are exposed to endocrine disrupting compounds throughout life and exposure has been linked to birth defects, cancers and autoimmune diseases. Great strides have been made correlating exposure to endocrine disrupting compounds with abnormal phenotypes, but identifying the molecular pathways that mediate such abnormalities has been an elusive goal. The zebrafish model system is an ideal tool to identify how endocrine disrupting compounds in an animal’s environment influence gene activity, where they act and how they affect development. Estrogens regulate the development and function of the reproductive tract, cardiovascular system and the brain (among other tissues). Many endocrine disrupting compounds mimic estrogens, making this class of compounds particularly insidious because they can affect multiple tissues in males and females. Detecting environmental estrogens is important. Traditionally, estrogen reporter cell lines or yeast strains are used to detect the presence of endocrine disruptors in U.S. rivers and streams. However, such tests provide no information about physiological or tissue-specific effects of estrogens. Our lab uses a transgenic zebrafish we created that reports estrogen receptor activation. Cells that respond to estrogen express green fluorescent protein. This allows us to identify in which tissues and cell types estrogens act during development. By 3 days post fertilization, natural and synthetic estrogens activate the reporter with varying potency in the liver and in several areas of the brain—regions known to respond to estrogens—as well as in heart valves, a site not previously known to be estrogen responsive. In collaboration with scientists at the U.S. Geological Survey Fish Health Branch, we exposed estrogen reporter zebrafish embryos to samples extracted from 19 locations along the Allegheny, Delaware, Shenandoah and Susquehanna Rivers. Sixteen samples activated estrogen receptors and 3 displayed a preference for the heart compared with the liver. 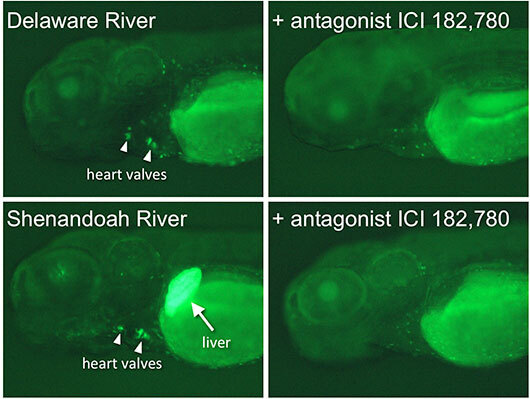 Samples from the same site collected at different dates displayed different patterns of receptor activation, demonstrating that the reporter zebrafish can detect changes in aquatic estrogen levels over time. We are collaborating with analytical chemists to identify the precise composition of these samples and the nature of estrogenic contaminants. Our estrogen reporter zebrafish have immediate application for economical in vivo chemical screens, however they are limited to compounds that act via estrogen receptors. Many endocrine disrupting compounds act via androgen, progesterone, glucocorticoid or aryl hydrocarbon receptors. We are generating transgenic zebrafish that report activity of these receptors. We anticipate these new tools will have broad utility, including the study of developmental and tissue-specific effects of simultaneous exposure to multiple endocrine disrupting compounds.